Cover:mint-- (still in shrink!) The "1.90" is written on the shrink, NOT on the cover! Taking their name from the document that helped establish the Canadian constitution, The British North-American Act was formed in Montreal during the mid 1960s around the guitar duo of Rick Elger and Bob Allen (both British immigrants), Kirk Armstrong on bass, drummer Dave McCall, and Andy Bator on organ, originally from Hungary. They played the local area, infusing their own psychadelic mix into light pop and folk/rock for a year or so, before signing a deal with Now Records. Label brass tried to give the band an identity and had them dress in period costumes, hoping to duplicate the success Paul Revere & The Raiders had enjoyed, albeit a few years earlier. 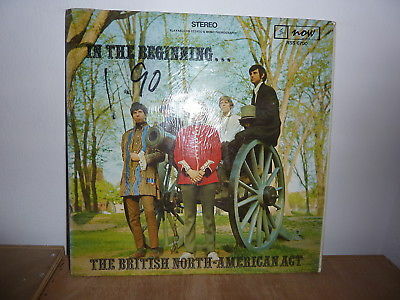 Produced by Brian Chater, also a native Brit, they released their only album, IN THE BEGINNING in 1969. The formula was simple - keep the songs short (the whole album clocked in at under 30 minutes), and the arrangements even simpler with some fuzz guitar and overworked organ. The single "Joe Cool" about a ladies' man b/w "The World Would Understand" made its way to the charts, and peaked outside the top 40 while the band toured central Canada and into the US. Other noteable tracks included "Just How Do You Feel" and its baroque-ish nostalgia feel, the overly cheery "Corduroy Coat," "If You're Looking For Honey," and "Don't Run Away." But by the beginning of the '70s, the band's label was out of business, the music had peetered out, and everyone went their seperate ways. A breath of new life was breathed into the band when the album was re-released in several countries, starting in 1987, then again in the mid '00s. "Don't Run Away" also made it to a couple of garage band compilation albums in the late '90s. Nachfragen: werden möglichst umgehend beantwortet. EU-DISCLAIMER: Dies ist ein Verkauf von privat. Mit der Abgabe eines Gebotes bzw. bei "Sofort-Kaufen" erklären Sie sich ausdrücklich damit einverstanden, dass Sie keinerlei Gewährleistungsansprüche oder Garantieansprüche aus irgendeinem Rechtsgrund haben! Die Angaben in der Artikelbeschreibung wurden von mir nach bestem Wissen und Gewissen gemacht.